The XPERIA Play uses the traditional droid Gallery, with solid functionality, cool 3D looks and nice transition effects. What we don’t quite like is that it only shows a downsized version of your images. The different albums and folders appear as piles of photos, which fall in neat grids once selected. If you have online web albums uploaded over at Picasa, those show up as separate stacks as well. Thanks to the XPERIA Play’s multi-touch support pinch zooming is also available here but you can also double tap or use the +/- buttons. The Android gallery shows only downsized version of you images, though if you send one from the device over email, the full-res shot is received on the other end. We guess it’s done to speed up performance and cut loading times. Images can be cropped or rotated directly in the gallery. Quick sharing via Picasa, Email, Facebook, Bluetooth or MMS is also enabled. There is no dedicated video player app on the XPERIA Play as in most of the droids out there. Fair enough, maybe a fancy UI for picking a video is not that important, playing videos is what really counts. Well, don’t get your hopes too high on this one either as the player supports only 3GP and MP4 – no DivX and XviD support on this one. If you take the time to convert your videos beforehand though, the Play does make for a good video player with its ample 4” screen. Or you could just download a capable video player off the Android Market and make your life easier. The music player interface on the XPERIA Play is laid out in four tabs for the available sorting options: all artists, all tracks, playlists and albums. Getting around is easy – and the UI is good looking too. The Now Playing screen offers all the standard music controls, shortcuts to the library and the Infinite key, which lets you quickly look up a song or album on YouTube or Sony Ericsson’s own Play Now Arena. The XPERIA Play has a rich selection of equalizer presets. 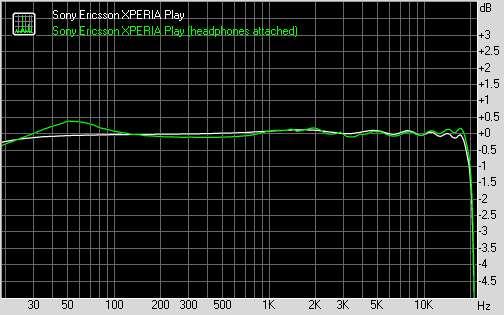 The Sony Ericsson XPERIA Play did very well in our audio quality test. The frequency response of the smartphone is perfect with no headphones attached and still easily within the golden +- 1dB deviation limit with headphones on. The only problem we had with it is the stereo crosstalk, which spikes intensly when you plug in a pair of headphones. The distortion levels increase too in that scenario, but they still remain tolerable. The rest of the readings are all great - the noise levels and dynamic range scores are among the best we have seen. With an active external amplifier you are also getting some pretty low distortions and stereo-crosstalk readings. Plus the XPERIA Play is reasonably loud so it's a very decent performance overall.